Ages 5 through 11. Now you can challenge students to listen, react to what they hear, and solve problems using high-interest, motivating activities. Target skills include following directions, categorizing, sequencing, asking questions, making comparisons, identifying causes, predicting outcomes, explaining events, and completing stories. Reproducible worksheets are included. 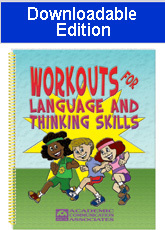 Get in Shape Language Workouts - The reproducible worksheet activities in this section are designed to strengthen vocabulary, grammar, auditory processing, and verbal reasoning skills. Each worksheet targets a specific skill. Students are challenged to think as they categorize words, give synonyms and antonyms, identify words from descriptions, etc. Working Out with Harmon Hippo - Harmon finds himself faced with problems everywhere he goes and students help him solve these problems. Students practice describing actions, making inferences, giving explanations, telling stories, making plans, sequencing information, predicting conclusions, and describing relationships.